"The latest development in Yemen's long-running civil war is playing out in the global routing table," Doug Madory reports in a blog post today from Oracle's Internet Intelligence unit. 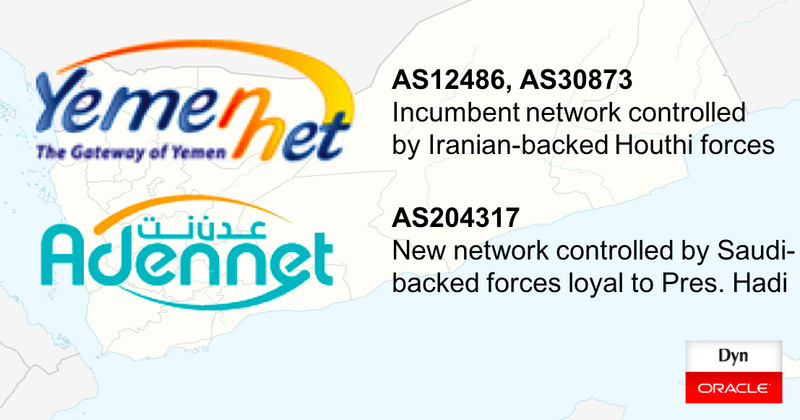 "The country's Internet is now being partitioned along the conflict's battle lines with the recent activation of a new telecom in government-controlled Aden. ... Internet service in Yemen faces myriad challenges in this troubled nation from hackers to sabotage. As the conflict rages on in Yemen, the country's Internet is now being partitioned between YemenNet (AS12486, AS30873) controlled by the Houthi rebels and now AdenNet (AS204317) controlled by the Saudi-backed Yemeni government." Local Time: Wednesday, April 24, 2019 09:04 PM PDT – Page Load: 0.2834 Sec.